If you haven’t had your hearing tested since your grade school days, you’re not alone–it’s not part of an adult routine physical, and, unfortunately, we tend to treat hearing reactively rather than proactively. The good news: Hearing tests are easy, painless, and provide a wealth of information to professional hearing specialists, both for diagnosing hearing problems and assessing whether interventions like hearing aids are working. 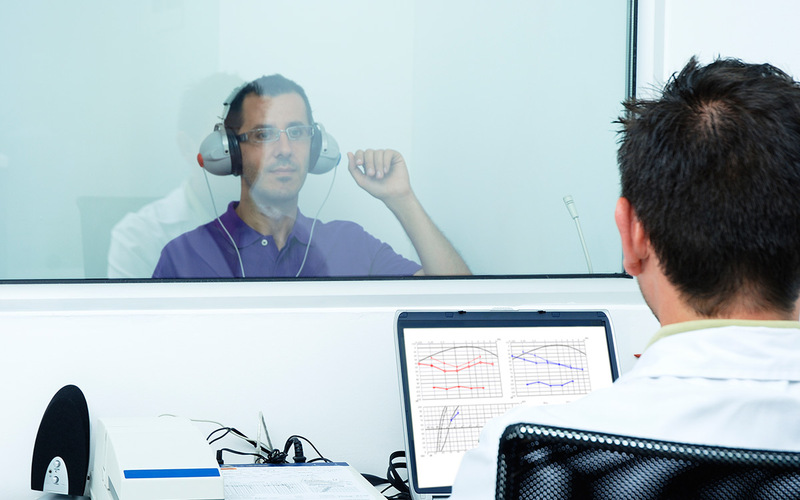 A full audiometry test is more involved than what you may remember from childhood–and you won’t get a lollipop or a sticker when it’s done–but you’ll gain a much clearer understanding of your hearing. Here are three of the most common kinds of hearing tests and what they’ll tell you. We usually think of sound as measured in decibels, but decibels just express the intensity of a sound. Tone–what we colloquially think of as pitch–is another key factor. It’s measured in Hertz (no relation to the car rental agency! ), with a low bass sound measuring around 50-60 Hz, and normal speech ranging from 500 to 3,000 Hz. Healthy human hearing ranges from 20 to 20,000 Hz–pretty much a whisper to a scream. For pure tone testing, you’ll wear headphones or earphones attached to an audiometer. You might also wear a device called a bone oscillator which sounds scary but just measures how well your bones conduct sound. Pure tones are delivered to one ear at a time, and you signal (by pressing a button or raising a hand) when you hear a sound. The hearing specialist will track the minimum volume necessary for you to hear each sound. In other words, this test gauges how well your ears function: What range of sound you have difficulty hearing (which can be a key indicator of whether you’d benefit from hearing aids), and whether you are experiencing hearing loss in both ears equally or if one ear is worse than the other. This kind of test measures your ability to accurately hear spoken words, again with sounds coming at you through headphones. In some cases, you’ll be asked to repeat recorded words that are spoken while there is background noise. In other cases, the person performing the test will speak words to you, but there’s a catch–you can’t see the person’s mouth. Hearing individual words means you can’t rely on context to understand what’s being said, and being unable to see the speaker keeps you from reading lips (something you may not even realize you’ve been doing). Words that rhyme–let’s say crime, time, dime, and climb–can be difficult for people suffering from high-frequency hearing loss to distinguish. Instead of simply looking at the volume or threshold needed for hearing, as tone testing does, speech audiometry measures your ability to make sense of the sounds you hear. Word recognition testing can also aid in assessing whether hearing aids could help. Okay, these can be a little uncomfortable, but shouldn’t cause pain. In tympanometry, a small probe is inserted in your ear, and air flows through it to artificially change your ear’s pressure. Your hearing specialist will get a graph readout that shows how well your eardrum functions, which can indicate whether there’s a potential problem like impacted earwax or a perforation. Though immittance tests are most helpful in diagnosing conductive hearing loss–problems with the eardrum and/or small bones inside the ear–because these can occur at the same time as age- or noise-related hearing loss, it’s important to include to know everything that’s going on with your ears. Are you having trouble hearing? Get it tested! A hearing specialist can help you better understand your hearing health, educate you on what you can do to maintain healthy hearing, and let you know what your treatment options are if you have hearing loss or tinnitus. Better late than never!